The French President greeted Donald Trump in Paris on Saturday morning ahead of Sunday's commemoration of the World War One dead. Emmanuel Macron called for the EU to build a European Army on Friday but as his statement was taken as an "insult" by the American President, he was forced to awkwardly defend himself as the pair met at the President's official residence, Élysée Palace. 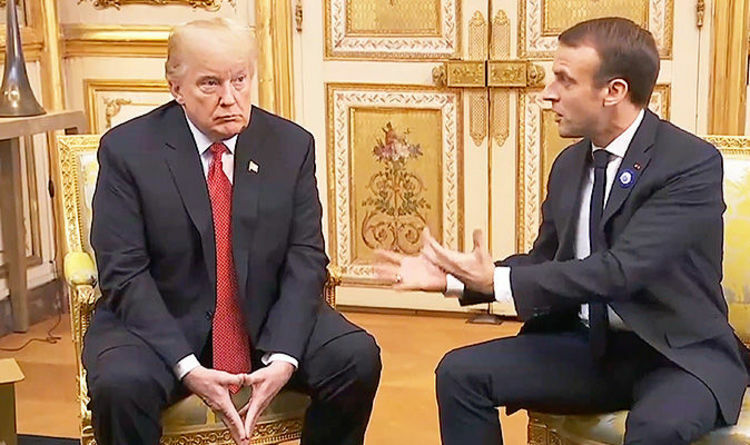 On Friday Macron said: "When I see President Trump announcing that he's quitting a major disarmament treaty which was formed after the 1980s Euromissile crisis that hit Europe, who is the main victim? Europe and its security. In response, President Trump tweeted: "President Macron of France has just suggested that Europe build its own military in order to protect itself from the U.S., China and Russia. The French President attempted to defend his renewed call for a united European defence by stating his intention is to "share the burden" of NATO's capability with America. He said: “I do share President Trump's view that we need a much better burden-sharing within NATO and that’s why I do believe that my proposals for European defence are totally consistent with that. He added: “It’s unfair to have the European security today being assured just by the United States. “We need a much better burden sharing. That’s why I do believe that we need more European defence in order to take this part of the burden. “When President Trump has to protect one of the states of the United States he doesn’t ask France or Germany or another government of Europe to finance it. A total of 60 world leaders, including President Trump, will be in Paris this week to mark the 100th anniversary of the end of World War One. Trump and Macron are expected to discuss topics including European security, Syria and Iran.